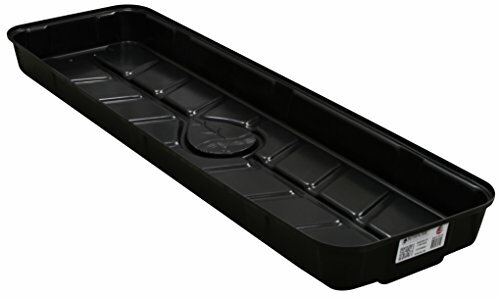 Hydroponic trays have a variety of uses depending on the size and type of tray that you have. Plugs are germinated seeds with a small quantity of leaves and a growing root system. Normally, hydroponics growers first germinate their seeds in a separate tray before adding to the main grow bed/s. The reason for this is that plugs have a much higher chance of surviving into full maturity than seeds that are just added to the hydroponics system haphazardly. This concept is not new; in fact, in conventional farming setups, the same system is used. The seeds are first germinated in grow trays and when the seedlings are of high grade already, they are transplanted to their rows where they are expected to bloom to full maturity. This guide will take you through the variety of grow trays available in the market and what we think would help your hydroponics system thrive, too. The Living Whole Foods Plant Grow Trays with Drain Holes is a seed starting tray that can house up to ten germinating plants at a time. 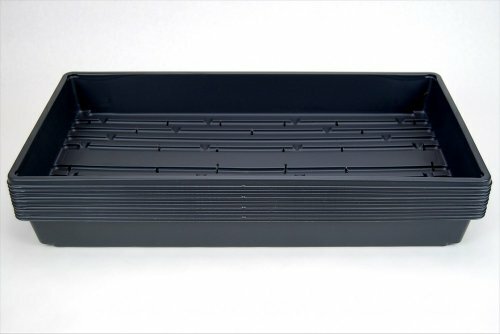 This is the perfect type of tray for growing news seeds as it is spacious, has a good, sturdy shape and was meant to be used in hydroponics systems. Measures 21” x 11” and comes in packs of 10, so you will be able to grow a total of 100 seedlings at a time, per pack. 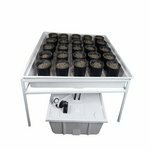 The Jump Start Heat House is a one of a kind growing tray that combines the best of grow cabinets and traditional seedling trays into one neat package. This Heat House has a total of 72 cells and has a protective dome measuring 7.5 inches. The heat mat helps improve the heating inside the dome and hastens the growth of seedling. Increased temperature inside the dome also help reduce the chances of root rot and the formation of other seedling-killing diseases like molds. 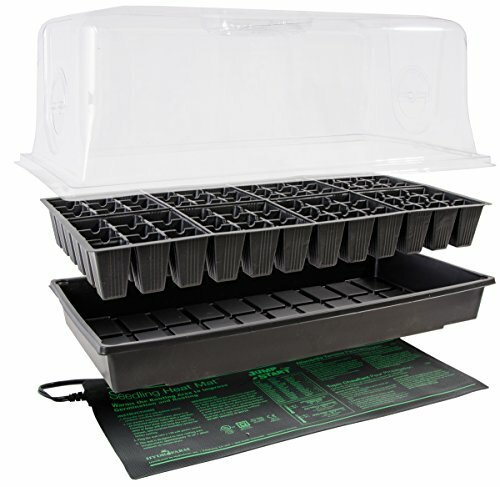 The Bootstrap Farmer 1020 Trays are rugged, versatile grow trays that can be used for passive systems that utilize a full flooding (no draining, only topping up of the nutrient solution). But don’t fret: you can add drain holes to this if you want easily, it just starts off as a solid unit with no natural drainage. The great thing about these trays is that the manufacturer also engages in hydroponics, and the trays they are selling are the ones they use for their own agricultural production. So in terms of durability and reuse after every growth season, you can be assured that you won’t be buying these trays repeatedly. You can sanitize them and reuse them after your seedlings are ready. Botanicare Low Tide Trays are huge and are simply perfect for high production of seedlings in one go. Let’s say that you have a large hydroponics setup that you need to populate quickly with robust seedlings. You have more than one strain of plants, and you’d like to grow seedlings (large swathes of them at a time) but you’d also like to separate them. This type of low tide tray would be a good idea. These trays can also be used to conserve the nutrient solution of an existing grow bed. The diagonal spacing of the trays inside naturally drain away excess nutrient solution but doesn’t soak the media as the space is depressed. The Botanicare Grow Tray is the perfect partner for growers who wish to establish long-term hydroponics systems. Its deep design allows for various uses in the hydroponics system, from grow beds to mini-grow trays for plants that are meant to grow to full maturity. 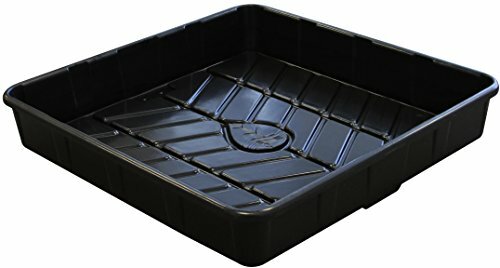 Made with durable plastic, these grow trays have been around since 1996, which is when the company began its sojourn to producing and distributing quality grow or flood trays to the hydroponics market. The Viagrow Complete Ebb & Flow Hydroponics System is a powerful, complete system that is perfect for new hydroponics growers who don’t know yet how to establish a robust growing station that is completely soil-free. When you’re just starting out with hydroponics, it’s easy to become confused with the sheer number of factors that you need to take into consideration when you need to establish a growing station. A growing station is where your seedlings will be placed until they begin to root and develop their primary foliage. It’s going to take a bit more than just watering your plants at this point. Since your plants are meant to be transferred to a hydroponics system, you need to germinate them in a hydroponics environment from the very beginning, because the rooting system of hydroponics plants and those cultivated in soil are slightly different. If you want an extreme example, check out the roots of plants cultivated using aeroponics! With this package, you get the grow tray with a 25-plant capacity, a stand, a nutrient reservoir and all the other gear you need to recirculate the nutrient solution throughout the system. This is a mini hydroponics system so you will get some good practice in monitoring and balancing the nutrient solution, too. The Fast Fit Tray Stand has just the right size for beginning hydroponics farmers and can be used for a variety of projects, not just for grow stations for seedlings. 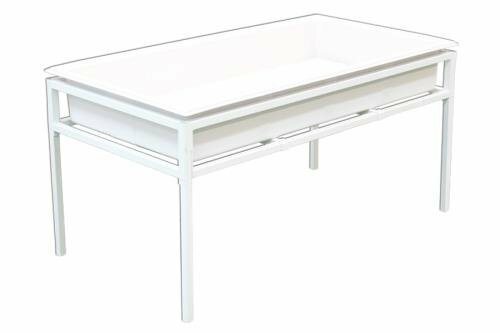 Use this 4’ x 2’ tray stand for large grow beds or even to support small tanks if you’re up for modifying it for other uses. When you have a sturdy frame to use, you will realize later on that it’s going to be used a lot in your hydroponics setup. Be creative and you’ll see that you need more than one of these in your greenhouse. The HydroFarm 4×4 Tray Stand with Light Kit is a great companion in any hydroponics endeavor because of its stainless steel construction, low profile and the light kit assembly that comes with it. What is interesting about the HydroFarm design is that it comes with a separate half-frame that can be used to suspend LED grow lights. We think this is a great addition to the usual tray support because we all need to suspend LED grow lights on top of growing seedlings, especially if the hydroponics setup is permanently indoors. This tray support is also easy to assemble, has caster wheels and you can easily wheel it about whenever you need to. Now that’s what we call real convenience! Media – select the proper media for your seedlings. Growing seedlings need lots of oxygenation and recirculation, and this should definitely be kept in mind when you’re mixing media. If you’re not too sure, try to find grow media that was designed for starting plugs. One type of media that many hydroponics growers prefer is the perfect starts variety that is made of a composite of biodegradable polymer and coconut husks. Use the right type of fertilizer when germinating seeds. Fertilizer systems for hydroponics are usually spit into three phases: starting, blooming and maintenance. There will be variations, but generally speaking, the starting and maintenance solutions are alright for germinating plants. Just make sure that you don’t put too much in the nutrient reservoir of your growing station, as overabundance of nutrients can kill fragile seedlings. Understand the needs of your plants. It’s important to note the nutrient requirements of your plants, as well as the pH requirement in hydroponics systems. There will also be information from other growers with regards to what type of germination scheme would be best suited for the crops that you selected. The more you know about the plants that you are working with, the better off your system will be. You will have plants that have strong root system plus you won’t have to worry about mass die-off when you begin transplanting your plugs into the main hydroponics system. Make sure that your plants get enough light. This applies most especially to indoor systems that are never transported outside. LED grow lights should be aligned with the growing station and there should also be a consistent day and night cycle. The addition of carbon dioxide can also be explored, as long as the extra CO2 won’t be an issue in the indoor space being used for the hydroponics system.